Shock wave boundary layer interaction is a common phenomenon that is experienced and observed in internal flows. The performance of aerodynamics is influenced by the consequences of the shock wave boundary layer interaction. The shock influences the velocity of an aerofoil by subjecting the boundary to the pressure. In this report, various properties of the pressure variable such as absolute pressure, relative pressure and the coefficient of the pressure have been analyzed to determine the effect on the velocity of an aerofoil. The production of turbulence leads to inclined performance losses in the performance of the aerofoil. Unsteady shock induced separation leads to loss of performance and destruction of the structure of the aerofoil. The need to achieve a balance between the Mac number, pressure, velocity, temperature, Reynolds number, turbulence, angle of inclination among other variables that influence the production of shock waves is the foundation upon which this simulation report has been founded. Shock wave boundary layer interaction are commonly observed in internal flows of high speed especially in compressor blades, turbine cascades, nozzles fans, and butterfly valves to mention but a few (Alshabu, Olivier & Klioutchnikov, 2006). Unsteady interactions of shock waves at the boundary layer has detrimental results such as buffet flows which are aerodynamic instabilities, shock induced oscillations (SIO) and high cycle fatigue failure (HCF) (Chen, Xu & Lu, 2010). 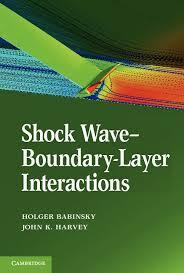 A propensity and need to achieve a balance between the consequences of the layer interactions makes shock wave boundary layer interaction a valid topic of research. Theoretical studies in the area indicate that shock wave layer boundary interaction is a phenomena that is dependent on the Reynolds number (D'enos, Michelassi, Martelli, Arts & Paniagua, 2001). Many studies have revolved around transonic flow in an oscillating airfoil. A study carried out by Tijdeman shows the interaction of the unsteady and steady flow fields and the periodic motion of the shock. Cascade models are also known to be self-excited due to transonic flow (Hasan, Matsuo, Setoguchi & Sadrul Islam, 2012). Measuring various parameters such as wake motions, static pressure and shock waves indicate that self-excited nature of a shock oscillation is due to a closed loop mechanism. A different proposition was made by Lee on a quantifiable feed-back mechanism of the shock oscillation of a supercritical airfoil flow (Lee, 2001). The results of the experiment were an indication that the time taken for a trailing disturbance to propagate from the shock to the edge was equivalent to the time taken by an upstream movement of a wave from the trailing end to the shock oscillation. The measurements were made at the force spectra which was unsteady (Levy Jr, 1978). The above hypothesis will be tested on a real time simulation experiment that will enable comparison of results. Quantified amount of research has been conducted on high speed aerodynamics. However, despite the extensibility of this research, there still lacks a comprehensible understanding of the flow characteristics of an airfoil in a channel. Providing a theoretical approach to the study is not only limited but also not enough. For this reason, this report is committed to providing a numerical analysis of the results of simulation of how shock wave boundary formation are formed. This is influenced via an ANSYS simulation in real time. A number of aerodynamics parameters such as the angle, static pressure, pressure oscillation, and root mean square, and frequency, coefficient of lift, drag, dynamic pressure and velocity are examined. The shape of an aerofoil has to be by convention prescribed according to the surface and velocity distribution parameters. Depending on the type of flow, various design models and mechanisms have been adopted for the inviscid flows (Levy Jr, 1978). For example, some are based on the stream function that corresponds to the function of the aerofoil. According to a report on how things work, the main requirement in functionality of an aerofoil is to provide enough lift in an effort to counter the weight of the plane (Menter, 1994). Viewing the structure of an airplane, the lift and the weight are the two major forces that interact and affect the movement and structure of the airfoil. The other corresponding forces are the thrust and the drag forces. This can be properly visualized in the structure of an airplane as presented in the figure below. The lift force is generated using the wings. An airfoil refers to the cross-section shape of the wings. Understanding the structure and properties of the airfoil is essential and has been presented in the figure below. When the pressure above the wings is more than the pressure below, a lift force is generated. The pressure difference between the below the wing position and above the wing position results to an overall net force upwards (Raghunathan, Gillan, Cooper, Mitchell & Cole, 1999). However, for this to be achieved, the following factors has to be achieved. One, the surface of the wing has to be curved or cambered and there must exist an angle of inclination that is tilted relative to direction of the airflow.